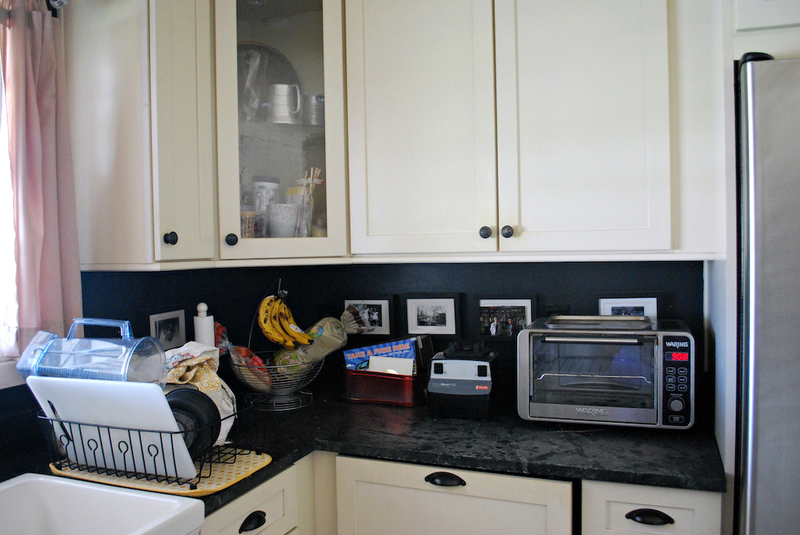 I never did decide what to do with the corner cabinets. The one on the left managed to stay clean (and unused) over the past two years but the right cabinet, positioned as it is next to the dishwasher and the counter of doom, collected grime, and dust, and the all the odd kitchen items without a home. 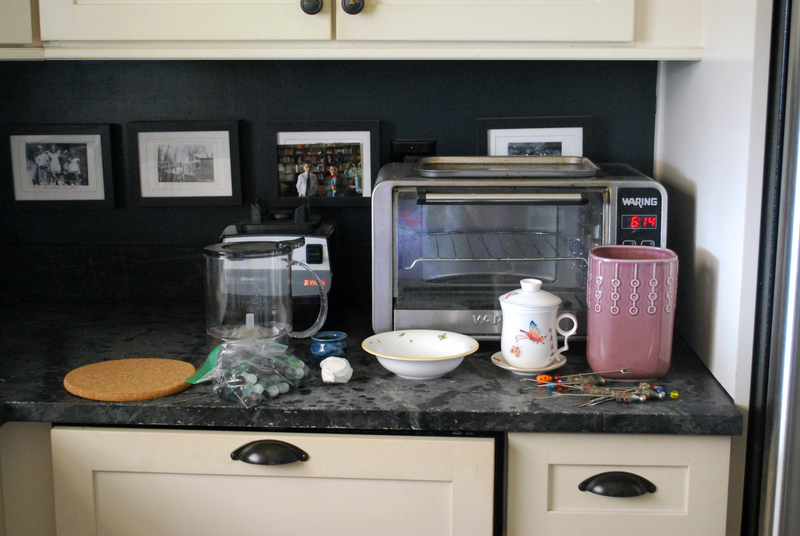 I decided to tackle the cabinet and the counter without a plan and hoped inspiration would strike as I worked. That’s not entirely true. The cabinet where we keep our glasses is due for a purge. It’s cluttered and full of mismatched glasses. I have way too many coffee cups–gifts from students–taking up precious room, forcing us to put my large, tall smoothie glasses on a higher shelf. 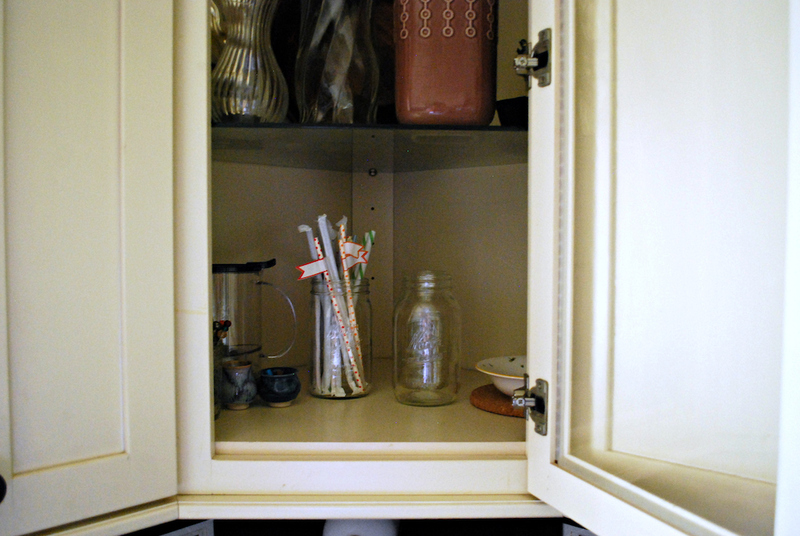 I can’t reach the higher shelves and since I have my favorite coffee smoothie almost every single day and never use the coffee cups, reorganizing that cabinet is a priority this summer. I figured cleaning out the corner cabinet and counter would create space that would allow me to store my smoothie classes on a lower shelf. 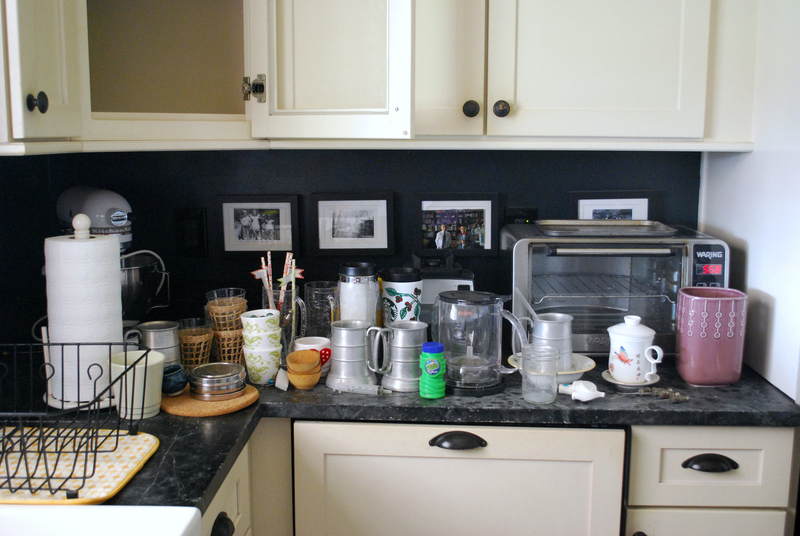 Every home has a surface that collects clutter, and for us one of the surfaces is the counter above the dishwasher. This is a collection of tins from Christmas. 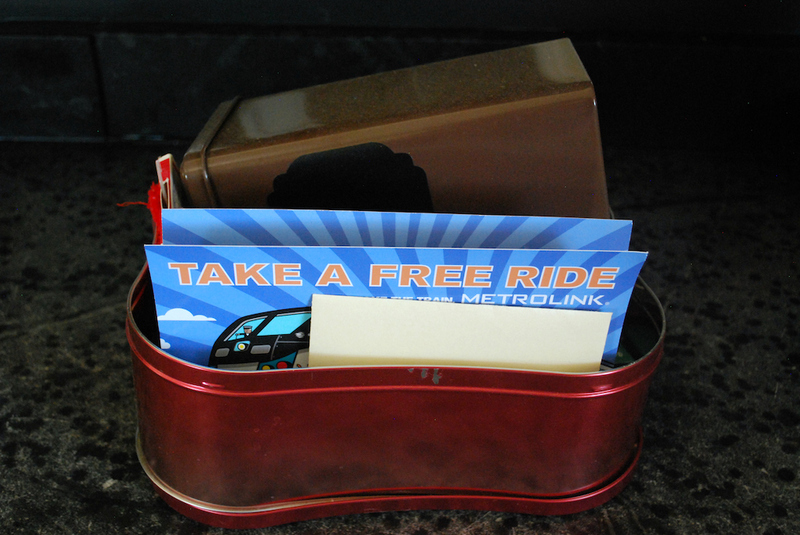 Empty gift tins from students, a gift card, a Metrolink schedule, a pair of new Christmas socks, and a PopSocket. I gave Mikey the PopSocket and told him to use the smallest tin to store his device cords. Everything else went into the trash or the donation pile. I stared at that pile for seven months and it took me less than 7 minutes to get rid of it. After I put away the hot pad and vase, I realized what was left was mine. At first I debated how I would fit my stuff on a shelf without taking up too much room, but then I realized that it wouldn’t be the end of the world if I took the entire bottom shelf of the corner cabinet for myself. It’s amazing how scandalous this idea was, if only for a split second. A whole shelf, to myself? The idea seemed decadent and a waste of space. 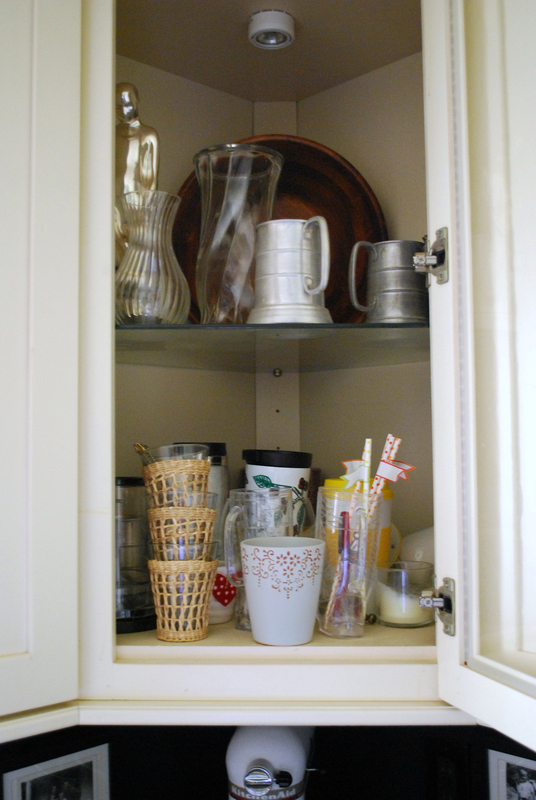 Perhaps it is, but I will not allow the urge to take up as little space as possible extend to a kitchen cabinet. In a couple of weeks, when I tackle the glasses, I will see if this is the best cabinet for me. This cabinet is deep and in the corner, so maybe I should take up the bottom shelf of the cabinet above the dishwasher. It’s the easiest for to access, so it’s something to consider. In the corner, or not, I’m taking a shelf. I’ll see if I can find one that is large and blends in with the cabinetry. I know this feeling all too well! We moved recently and I now have so much kitchen space (to me, that is- to others it’s a small kitchen) I don’t know what to do! I have kept one deep drawer empty and I plan on keeping it that way! Also, what IS is about those STACKS and PILES that linger for MONTHS and when we finally go through them, you have NO IDEA why you’ve been putting it off for so long?! I have too many of those in my trouble spots (kitchen counter, laundry room desk, office desk), and that’s what I’m trying to tackle this summer. P.S. Once again, Chrome hated me and wouldn’t let me post, but IE seems to be working. Technology is not my friend. I just moved and combined households. 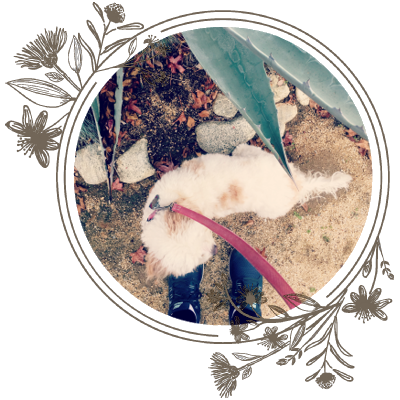 In the process I let go of things that have been moved around with me for YEARS,. I was finally ready to let some sentimental items go. ( I’m 46. I finally threw out diaries from middle school that had been packed away) I’ve always been good about clothing clean out and taking care of clutter piles, but for some reason certain things I kept holding on to through each clean out, pack and/or move. The thing I had to laugh about was your comment about mugs! YES! I had mugs that were given as gifts… FINALLY. I donated them. We are starting fresh. It’s amazing to have space and go forward without having to manage the stuff. 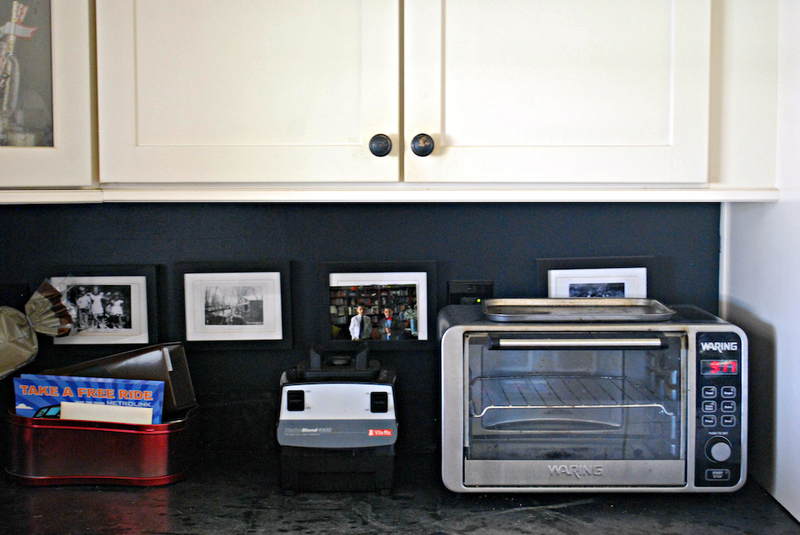 Any horizontal surface that isn’t regularly used for some practical purpose becomes a clutter magnet in our house. This includes the end of the dining table, the coffee table, chairs that are only used when we have guests… Often it’s because we haven’t quite decided what to do with the stuff, so we leave it there for “later”. Your post inspired me to tackle a ‘dead’ corner of the kitchen bench. It took about ten minutes to clear a handful of random items that had been there for MONTHS. I’ve got my sights set on a couple of other spots now. I love that you’ve resolved to take a shelf for yourself. Guard it well!